FairLifts partners with a wide range of certified pilots and professional crews to provide helicopter services for Nebraska transmission line construction. 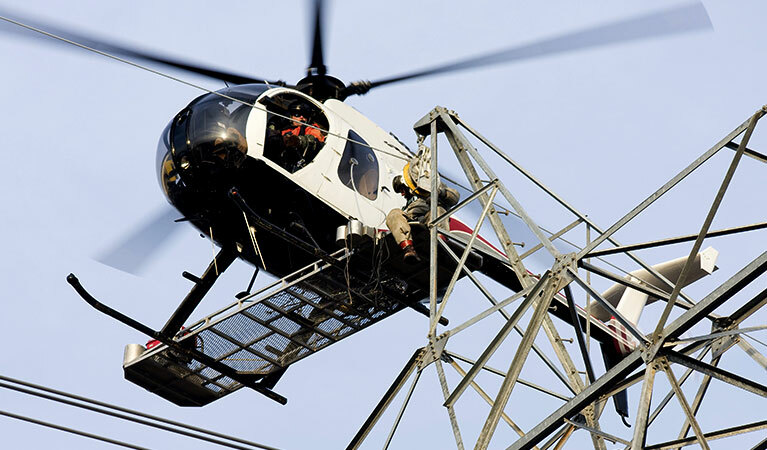 Helicopter tasks that assist with transmission line construction include the construction of towers, stringing wire, the installation of utility poles, and logistical transportation. Helicopters can perform the work quicker, create less stress on a ground crew, and take the heavy lifting out of the operation. FairLifts wants to help you with your transmission line construction anywhere in the state of Nebraska. Much of Nebraska is regarded as being mostly flat with the Great Plains that are found east of the Rocky Mountains. Farm country is popular throughout the state as well. However, the central plains prove more of a challenge for transmission line construction. The land can be extremely hilly and more rugged in general. Not to mention, an abundance of small rivers and streams pose a challenge for transmission line construction as well. A helicopter can help navigate rough terrain. FairLifts is waiting, ready to arrange transmission line construction services at any time. We can arrange helicopter services with experienced pilots and personnel to help with transmission line construction. Read on to learn more. Heavy lifting and tower construction is a natural part of transmission line construction. A helicopter can lift more than most people realize. This means it can help with precise heavy lifting and take the burden away from a ground crew, reducing the need for manual labor. With the help of a pilot, stringing wire is easy. This precision work done can take time out of stringing wire. Hundreds of miles of wire can be strung in only a matter of days, performing the work quicker than a ground crew. Installing a utility pole is often times tough work. Sometimes the environment poses a challenge. Other times it is getting the people in the right position from the ground. A helicopter can be a vital part of utility pole installation with its heavy-lifting ability. In the past, ground crews would analyze the land from the ground. A helicopter offers a bird’s eye view of this same land in a quicker amount of time. The same inspections that would previously take weeks on the ground only take a matter of days with a helicopter. Transportation can prove problematic with certain regions of land, whether it is a rolling hill of streams and rivers. A helicopter can ease you of this burden, transporting whatever you need to any given location. This may include supplies or workers. Get a quote on Nebraska transmission line construction services. At any time, night or day, FairLifts is available to assist you with questions about Nebraska transmission line construction. Our experts are standing by 24/7 to speak with you. Whether you have a question about the services or want a quote, do not hesitate to give us a call.